I started to write this early Wednesday morning, it took several revisions through Thursday to refine my thoughts with clarity. I have returned to a far more equanimous place since that morning...but I had to be with the uncomfortable feelings, write about them in order to find my way back to center. My posts have been so simple this week, I've needed the mental and emotional space, the distance from the heaviness I have been carrying. I hope reading on won't be a disappointment for you if you are expecting sweet, gentle wisdom. Sometimes expression in a few lines is enough. Other times there is a torrent of emotion that must gush forward; my outpouring below is quite lengthy, I can understand if you feel satisfied with the images and haiku at the top of the page and want to stop reading right here. If you choose to continue on this written journey with me, trust that it is not all sadness, fear, and frustration, but processing of complex emotions, wholehearted expression, that does resolve to a peaceful place. Perhaps tucked between the lines of my story you will find a piece of yourself that needs to be released too. My heart is feeling constricted, fragile, blue. I made it through these past twelve days of knowing that I am approaching another big decision about medical treatment. Until now, only the first night of hearing the news from my local neurologist caused me to be distraught. I’ve spent time directing my attention toward joy, opening to light, to wonder. Not pushing the feelings down or away, exactly, just choosing not to be hooked into worry about something, when I don't have all of the information yet. I woke early, 4:15-ish before starting this post, feeling tightness throughout my body, the icy dagger of fear plunging in and spreading cold though out my typically patient, pliant heart. I felt sad, and scared, keenly aware of edging closer to that point of meeting with “the doctor" on Monday. I know from conversations with my other neurologist that options are limited. There just aren't that many medications on the market for slowing down the progress of RRMS (none for PPMS so in that regard I'm quite fortunate, I recognize this, I am grateful); several drugs had already been ruled out for me in the past. I keep thinking, thinking, thinking (wishing? )…If I would just get up and DO more...(you know, the blame game, the one that fools one into believing “I have more control, more power” than I do)…yes IF…THEN… I could somehow DO more all day long, like other people…like physically abled people. Maybe I'm not trying hard enough. Maybe if I pushed harder I could build up my endurance and my legs would eventually stop shaking and buckling and dropping me to the floor...maybe my legs and back would stop cramping, maybe my head would not twist from side to side as though possessed by a dybbuk; "no" or up and down "yes". Maybe if I really tried I could retrain my brain not to become disarthric when tired (sometimes for days after the onset), or lose my balance and stumble looking to those unfamiliar with neurological diseases like a person who is quite inebriated (even though these are the things that always happen when we push too hard in physical therapy and also completely randomly and unexpectedly at home when I've done absolutely nothing but rest.) Yes the MAYBES attached themselves to the IF....THEN's...a nearly unstoppable locomotive. Maybe I can stay on THIS medicine…maybe my senior neurologist will say I’ve still got time on this drug, it’s keeping new lesions at bay after all. She MIGHT say the danger of staying on for another year while a higher risk for developing PML, is still worth the benefit. I've had the JC virus all along, so far have not developed it...she really might think that's the best plan. So what if my response to Tysabri isn't as spectacular as it is for some patients (some people feel more energized and their walking improves, my walking has gotten worse). There are risks with every single other drug therapy too. There it was, the reality I had chosen (until now) not to think about...the reality of "I just don't have any idea what she will recommend or what I will choose given her suggestions". The wishes and worries grew louder and louder and louder in my head. They are very hard to tame, to simply be with, when I give them that amount of attention, so I tried again to release the tightness around my blue heart…to feel it, see it, hear the words and let them slide by, breathe, let them go. I meditated in the darkness that eventually lightened to a flat, gray expanse outside my window, inside my mind. I sat and watched the sun break through the clouds. 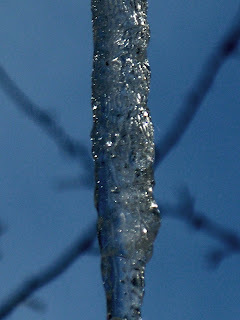 Gray shifted to blue, while sun glinted off thawing ice, residue from the storm the day before. 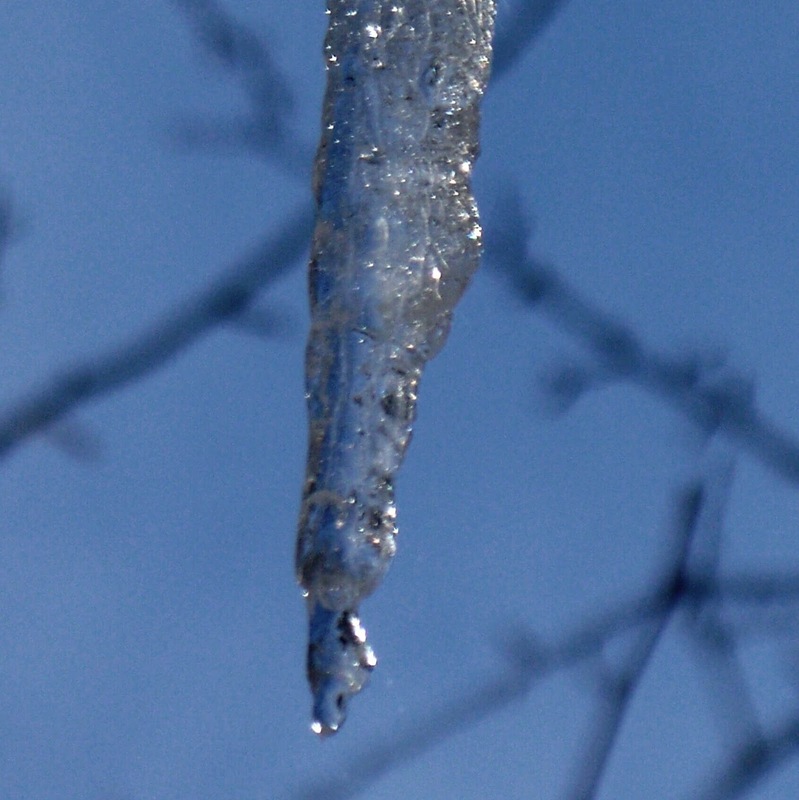 I picked up my camera, walked upright, down the stairs and captured this crystalline ice dagger and ephemeral blue January sky. I witnessed beauty; I recorded it. Then, back up the stairs, still invoking courage to let go of my energy hoarding tendencies, this growing fear of DOing. I mastered the stairs once for the day already, on to the next adventure. I lowered myself into the tub on my own (something I usually do), Gordon was down stairs on a work call; I didn't want to bother him by shouting. I’m a grown woman. I want the freedom to get in and out of the bathtub unassisted. (Some days I can, other days I simply can’t get up and over the edge on my own.) After a long talk with myself in the tub, a pep talk of sorts...ok not totally pep, half encouragement, half judgmental lecture, feeling determined, pushed up from the side of the tub, stepped over, dried off, dressed and proceeded to begin a “real Mom” task. Bending down, standing up, gathering the jeans, shirts, undergarments, stray socks from girls bedroom floors, the ones that never made it to the hamper, (thankfully most had) righting pants legs, (what is it with kids and one jean leg inside the other leg out?) and placing the whole assortment into smaller baskets that a kind friend would soon come and deliver to another kind friend's house to be washed, I muttered guiltily in my mind, "I should be washing OUR laundry, ME." Gordon heard my heavy feet gimping around, was done his call and joined me in the laundry processing. This “real Mom” task took all of five minutes before my energy hit a wall. I felt nauseous and faint, exhausted and tingling all over, could barely make it back to bed. Had Gordon not been there I would have slithered down the actual wall to the floor, feeling miserable, eventually crawling back to bed on my own. I could have done that, it would have been a long exhausting journey across the hardwood boards. But he was there so I didn't have to. He gently lifted me and guided me the few feet down the hall to our bedroom, holding my hands as my legs jerked and shook, my head flipped from side to side. I stretched out on top of the unmade bed and cried. I remembered: This is why I don't get up and DO very much...because it makes me feel so damned sick! It makes me feel even more helpless. And I realized, of course, I should have waited 20 minutes at least after my bath to attempt anything else. But I WANTED, I wanted to just do a “real Mom” task. Through my tears I told him how sorry I was, sorry that this was his life too, sorry because this illness is not mine alone. And he stood there silently, allowing me to just pour out my heart until I was empty of words and tears. I felt such sorrow for him, for the girls. Sorrow mingled with gratitude for this man who has never once complained, who is ever present, who cares for me, compassionately lifts me up when I fall, carries me when I cannot walk, prepares meals for me, for the children, for himself, works hard to provide a home for us, who has been my best friend and confidante for nearly 25 years. The sadness receded, the love rushed in like high tide. Mostly I feel contented, my life is simple now, I watch the world through my windows, and I chat with people online, on the phone, with my girls on the bed when they arrive home from school, with the occasional visitor who comes to our house. I write, I take photos, I meditate, I read. My life has been distilled and stilled. Generally I am happy, this is the truth. This gentle, satisfied, compassionate aspect of myself is the one I most often share on this blog. But to never show my shadow would be a disservice to you my friends and to me as well. I am a whole person, we all are, and every moment is not rosy, or easy, this too is true. Like the gray to blue and back to gray, the transition to black night and then the return to morning sun, it all passes, these shadows, this light. I am living in between the life I knew and the life I imagined I would be living at this time, at the ripe old age of nearly 46. I am living like you, in the here and now. For me, now is a state of being not so disabled that I am completely bed or wheelchair bound, and now is a state in which I don’t have enough “oomph” to allow me to really function for more than a few minutes at a time around the house, wall walking from room to room, as fatigue sets in, that's if I make the effort to go downstairs. Yes I am miserly with the vitality I do have…though the more I contemplate this, the more I wonder what exactly I am saving it up for, or if it is a commodity that can be saved. In writing this I realize what a silly subconscious notion that has been. We used to joke about this my sister and sister-in-law and I, bottling our children’s energy and selling it when they were little. We’d have become billionaires servicing several cities off our seven tykes back in those days. I didn't know this place existed before two years ago, this liminal life space of hardly any independence in the physical realm, but vast freedom of mind heart and spirit. I mean, I had an inkling, but I didn’t really KNOW this space, having spent only limited amounts of time here in the past 10 years of chronic illness. The thing is, thank God, I CAN get around the house without my wheelchair again, but only for small segments of time (I could not do this a few months ago, so I am grateful for this truly amazing grace, and imagine that the time will likely come when I am back in the wheelchair more regularly again...another unknown, maybe that won't happen?). I can walk with my walker from the car and into the physical therapy building and exercise for 50 minutes, two days a week with rest breaks as needed. We are maintaining strength, balance, tone, primarily from static positions, using targeted muscle groups. This is not the same as the miraculous nerve-muscle coordination required for walking. Walking tires me too much too soon to get in a good general work out. REALLY do you have any idea what a miracle it is for everything to work the way it is supposed to so that a person can walk??? I marvel at each step. To think about this fills me with awe I cannot fully express in words. Sometimes I think my life resembles that of a cat, although they nap and I don't. I'm awake all day, and my mind is active, creative, inquisitive, engaged, busy. My muscles are reasonably strong all things considered, and I still have been able to maintain fair flexibility, but they do not work well in concert because my nerve conduction is poor, and they seem to work against each other instead of with each other, therefore I feel incredibly caged by fatigue when I try to DO much of anything that includes walking or standing for longer than a few minutes sustained. Doctors and OT’s and PT’s recommend, “pacing” myself. Completely logical, but HOW can a person ration off their daily supply of energy when it is never the same supply, day-to-day, moment-to-moment??? (Ok admittedly, I should have known that going from tub to laundry was asking too much of my body with out resting in between.) My physical therapist knows me so well at this point that he can usually tell by my gait as I walk into the gym with my walker how much to push me…but sometimes he can’t, sometimes we go too far and I leave in a wheelchair, and Gordon piggy-backs me up the steps to bed. It is impossible to describe the density of this kind of fatigue to anyone who has not experienced it, except to say; the weight of it has me waiting for bursts of energy (again visualize a cat) and then wading back through the thickness, for that is what it feels like, when my nerves are over taxed; wading through something thick, heavy, immobilizing, like mud or quicksand. I cannot lift my feet off the floor without assistance when fatigue mysteriously creeps in. I either lift my feet and drop them down hard like Frankenstein's monster or shuffle along awkwardly, legs quaking. Without something to grab hold of I fall. With rest, I can start again...but it all depends on the day, the phase of the moon, the alignment of the stars, the temperature in San Diego, the barometric pressure in London, how many people are at home on our street at the same time, the number of buttons on my shirt (if my shirt HAS buttons that day), what we will be having for dinner in the evening (even if it is now morning)...I think you see my point. In the midst of writing this post, my friend sent me this message, not knowing what kind of morning I was having. May you know His presence on your journey through this day...” she said. Perhaps because she too lives with chronic illness, her sixth sense could feel my turmoil? The sky has turned gray again, folding the blue into clouds like a mama pulling her babe in close to her bosom, hidden, comforted, safe. My heart is not the tight fist it was when I started writing this post. Pouring out my story never fails to lift me, to ease the reins of gravity; my body is endlessly subject to, to allow respite, relaxing spastic muscles into a soft sigh. So often writing becomes a visual form of listening to my soul singing. Do you know what I mean? Yes, God’s presence is known to me, when I notice the beauty of an icicle piercing my view of the sky, when I cry, when I feel pity (or compassion) toward myself (toward others), or angry about not having the physical freedom I would like to experience. God’s presence is known to me, when my husband comes up the steps at the right moment and a friend sends me a message I needed to hear exactly when I received it. Both/And, as one of my teachers was fond of saying…yes, I am BOTH this positive, content, woman who is filled with gratitude for life and the bounty of blessings I have been granted, AND, I am this same woman who struggles, and hurts and worries and feels frightened and is not always kind to herself; sometimes an open rosy blossom and sometimes a tight fist of a blue bud...or a multi-layered, beautiful, ice dagger piercing the sky of my own mind. ((((Laura)))) Thank you my dear sweet friend for sharing your truth, your heart, yourself with us. As I inhaled each word my tears increased because I related all too well to your words...either for myself or this woman I care for. I so appreciate your honesty and your realness...it gives me so much hope...this morning my pain levels are way up there and it is 27 below 0 today which seems to have a way of making it harder to move so your words are a very welcome gift to me this morning...thank you...you inspire me Laura to keep moving on this journey...thank you! and for more energetic moments than not. Yes, it is good sometimes, to write the pain as well as the joy. For you, and for others who share similar pain. This is actually not a depressing post. It is, simply, eloquently, real. Laura, I so admire your openness, and the bravery that this sharing, as well as facing the emotions that accompany your illness, entails. You really are amazing. I hope you *know* that. Laura, I can only imagine your frustration that the simple things you want to do, are not simple at all, but complex and painful. I do know that your honesty is deeply moving and very inspiring. I know that's not what you want, but it is something very profound. My dear heart, soul sister, my words aren't coming - I am only able to sit here and hold you, imagining the embrace I would share with you were I there beside you. It is a great honor to be able to witness your grace, strength and courage in sharing the fullness and wholeness of who you are and all you are experiencing. I thank you, I love you, and send blessings with my daily healing prayers, as I hold you clearly each day. Thank you for sharing your life with us, for being willing to write about the sorrows as well as the joys. Your bravery is such an inspiration to me. So is your strong spirit and your strong faith. I feel so blessed to be your friend. Laura. I wish I were there with you to give you a big hug. I am glad that you allow yourself to be human, because then your spirit blossoms once again. Thank you for sharing so much. Please consider me a friend who thinks of you often and prays for your wellbeing. Blessings. My heart went out to all you said. You have creative soul. I think it is blessing. You can easily give people such a joy of reading your posts. Perhaps you may think me silly but I agree with your friend message. Oh, I don't know did I express myself clearly? Checking on you here. Such a lovely journey. God blessed you so much. Keep warm! I hear you. I do. You are a Samurai and so am I. The gift of your raw, unadulterated honesty reaches far and wide. Dear Laura, my heart goes out to you...I'm sending youa great big hug and am hoping that getting all of this out 'on paper' so to speak has helped you. Letting it all out is all we need to clear our head and hearts and get back to feeling a bit more like ourselves sometimes. But you know, what those who care about you love you for is not you ability to walk or do things for them, it is YOU the love. WHO YOU ARE not what you do. We often think that people will love us more for the things we do for them and give them, but what truly touches them the most is the THOUGHT behind what we do for them, the feelings you share with them and the love you give them and no matter what happens, you will always be able to give them your love. I think it is very healthy to be able to write out what you are going through and there is no way around the fact that it's a hard road. Your photograph was very beautiful and touching as are your words. Just a line to tell you "I understand" In my 3 score and 10 years I have experienced much. So much I do not know and thought by now I would have arrived. Sadly not so. But I do know that God is ever faithful and is with you every step of the way. "... distilled and stilled ..."
That is why I find haiku poetry to be so effective. And the one at the begining of your post is masterful. Thanks for sharing your complete self with us. I am sure we all love you all the more for it. Your ice dagger photo is just beautiful! beautiful dagger - is so raw and beautiful. It amazes me that you take the time to visit me and offer words of encouragement when you have burdens of your own to bear. It speaks to your spirit of heart and how bright it shines. may peace be with you. It is good to share. It is healthy to not bottle up the truth and keep it hidden away. It is an honor to be trusted with your story. Thank you for sharing this part of yourself, as ALL parts are beautiful. Your words are such an expression of the heart... please know my heart is with yours, though I may not express it so well. I think, of all of your posts, this is the one I appreciate the most. Because it helps me know the situation you are facing and enduring with such courage, with such hope and radiance of spirit. You truly are inspiring. I have CFS so know something of fatigue, but nothing like what you are experiencing. Yes, it IS a miracle when bodies can walk about and get themselves places - one we too often take for granted. Take good care of yourself, and that you for sharing your journey. 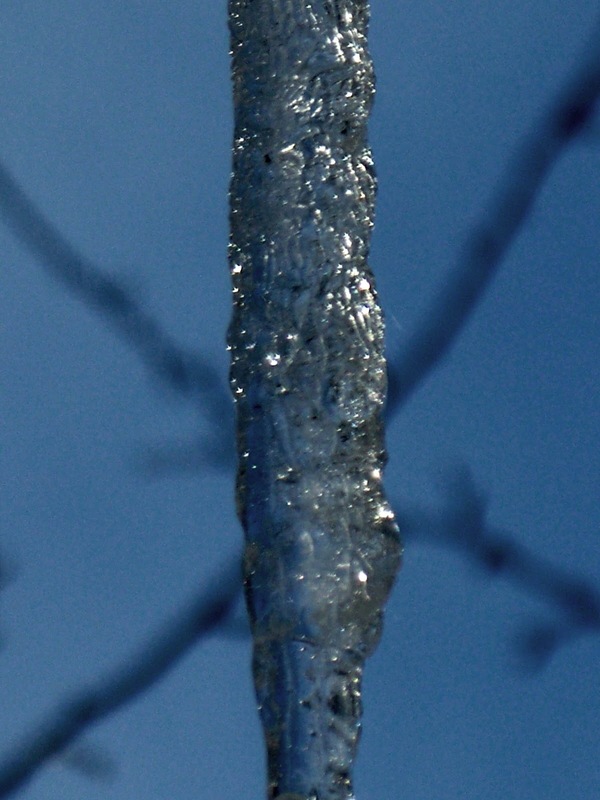 The ice dagger photo - all of your photos - are incredible. Lovely photos Laura. I could't read your whole post well, the MS eyes are not up to it, but I just wanted to say...keep fighting...although the battle may seem long and arduous, you can claim victory, even if "only" in your mind and soul. My dear sister cat:) We must put up with so much in order to achieve what sometimes feels like so little. But for us, in this moment, at this time, it is enough. I am holding your hand on this journey as we experience the peaks and valleys through each others eyes. I am here, my friend. I am here. I am quietly sending you my love and my strength and my prayers. Thank you for sharing your feelings. I hope that you will be able to make a good decision for you... and I pray that you find pockets of energy and love and comfort. I pray for you that God will give you more strength, love and guidance. He is always there for us. And thank you so much for your visit. Greatly appreciated. Dear sweet Laura, as I read your story with tears brimming I am thinking .... what an amazing woman. You endure so much and write so beautifully, sharing your story and your wisdom .....drawing us all together to find a piece of ourselves "that needs to be released too". I hold you tenderly in my heart and send love and healing thoughts. Very gracefully expressed. Having had a stroke I know what it is like to have your body betray you. Physically you do what you can, while mentally you are still allowed to soar. Good wishes to you. My heart goes out to you. You bless my life with your honest words and your life.